ROME – Inter Milan struggled against a revived Tottenham side in London in the Champions League, while Napoli’s win at home to Red Star brought them one step closer to the last 16 of the European competition. A late goal from Danish maestro Cristian Eriksen gave the London side a crucial advantage in a nervy fixture at Wembley. Having started on the bench, the midfielder was brought on by Mauricio Pochettino after 70 minutes and had an immediate impact. His first touch was a beautiful freekick that Jan Vertonghen somehow headed wide, before the Dane found space in the box just 10 minutes after coming on and finished calmly. Inter’s resolute defence couldn’t hold out for 90 minutes, but still remain favourites to claim second-place in Group B. The two sides now sit on 7 points each with the same goal difference, meaning that Inter have to better Tottenham’s result in the final group game to progress. However, the London side have to travel to the Nou Camp to face Barcelona, while Inter host bottom-of-the-group PSV at the San Siro. 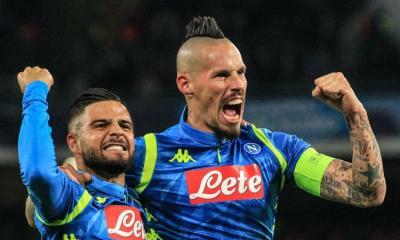 Napoli fared somewhat better than their Italian counterparts at home to Red Star Belgrade, securing a comfortable 3-1 victory. A brace from Dries Mertens either side of half-time followed Marek Hamsik’s 11th minute opener, sealing the three points for the Italian side. Despite a consolation from El Fardou Ben Nabouhane, the Serbian team never looked likely to threaten Napoli, who now sit top of the highly competitive Group C. With just one game against Liverpool to play, a draw or win will send Napoli through to the next stage. Given the clubs’ head-to-head record, a 2-1 or 3-2 loss will also be enough to secure qualification for the Italian side.